Machu Picchu without tour: What tickets to buy? What tickets to buy to go to Machu Picchu without a tour? Traveling to Machu Picchu without a tour and on your own is easier than you think. You only have to book your ticket online for the day you want. You must also get train and bus tickets to the Wonder of the World. How to organize the trip on your own? Know the tickets you need and be encouraged to experience the magic of Machu Picchu. How is the trip to Machu Picchu with tour? How is the trip to Machu Picchu without a tour? What tickets to buy to go to Machu Picchu on your own? How to visit Machu Picchu on your own? How to visit Huayna Picchu on your own? How to visit the Machu Picchu mountain on its own? How to visit Machu Picchu and the Museum on its own? How to hire a tourist guide in Machu Picchu? The tours to Machu Picchu are 1 or 2 days. A tour usually includes the transportation service (round trip), the entrance to the Inca City and the tour with a tour guide. The prices of the tours vary according to the number of days and the quality of the service (the type of train, the hotel, the restaurant). The costs are higher compared to a visit without a tour. Traveling to Machu Picchu without a tour is easy. You only have to book online and in advance the entrance tickets, train and bus to Machu Picchu. The tourist guide service, the food, the hotel and other expenses are paid by the visitor. The trip to Machu Picchu on your own is the most economical way to know the Wonder of the World. In addition, it allows greater freedom of decision for the tourist. What ticket to buy to go to Machu Picchu on your own? There are 3 tickets needed to know Machu Picchu on your own: the Machu Picchu ticket, the train ticket and the bus ticket. 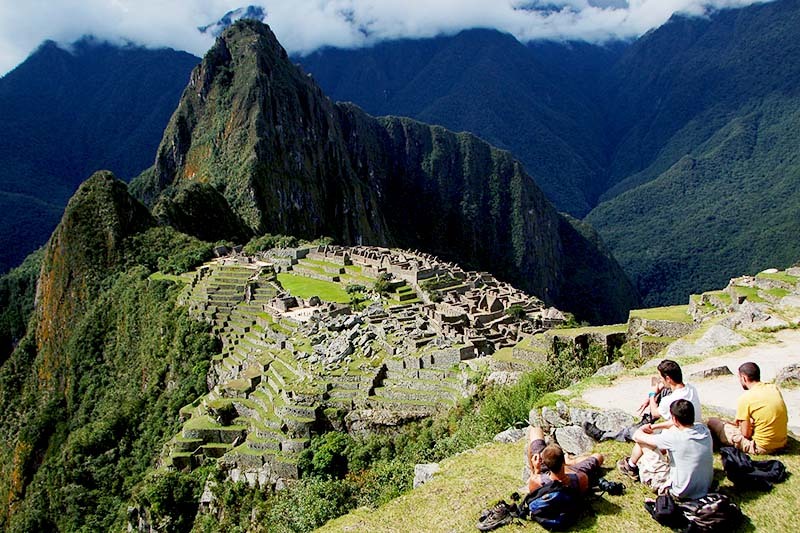 Currently, there are 4 types of tickets in Machu Picchu, which offer a different experience in Machu Picchu. When visiting Machu Picchu, the visitor must choose one of these 4 types of tickets. Group 1: from 6 am to 1 pm (entrance to Huayna Picchu from 7 am to 8 am). Group 2: from 6 am to 2 pm (entrance to Huayna Picchu from 10 am to 11 am). Group 1: from 6 am to 2 pm (entrance to the mountain from 7 am to 8 am). Group 2: from 6 am to 3 pm (entrance to the mountain from 9 am to 10 am). * The Museum remains open from 9 a.m. to 4.30 p.m.
Each type of Machu Picchu entrance is subject to availability. It is recommended to book tickets online and in advance. There are two companies that offer train service to Machu Picchu: Peru Rail and Inca Rail. The reservation of the trains is through the internet. Prices vary according to train services to Machu Picchu. Vistadome – Train with wide windows and service on board. Expedition – Train with wide views that include snacks and Peruvian food. Sacred Valley – Exclusive train that has a bus stop in Urubamba, in the Sacred Valley of the Incas. Belmond Hiram Bingham – Luxury train. It has dining room, bar, service on board and lunch or special dinner. The Voyager – Train with wide tables and windows. It allows a pleasant trip with service on board. The 360º – Train with panoramic windows. It has service on board, music and show on board. The First Class – Exclusive train that has music, tables, windows, welcome cocktail and other services on board first class. The Private – Luxury train for a private group (8 people). It has decorative details, gourmet lunch or dinner and free bar. Peruvians can take the local train to Machu Picchu. This service does not have the amenities of a tourist train but it is cheaper. The train tickets transport the visitor from the Ollantaytambo station to the town of Aguas Calientes. Once in the town of Aguas Calientes there is only one bus trip to the entrance to Machu Picchu. To make this journey you need to get one of the bus tickets. Bus tickets can be booked online or purchased directly in the town of Aguas Calientes. The price for foreign adults is $ 24 (round trip). Children have a discount. The bus trip takes between 30 minutes on average. It is also possible to make the journey on foot. How to visit Machu Picchu without a tour? To visit Machu Picchu on your own you need to book the 3 tickets: the entrance ticket, the train ticket and the bus ticket. Step 1: Travel by bus or minivan from the city of Cusco to the town of Ollantaytambo. Step 2: Travel by train from Ollantaytambo station to the town of Aguas Calientes. Step 3: Travel by bus from the town of Aguas Calientes to the Machu Picchu gate. Step 4: Enter Machu Picchu in the late shift (from 12 pm to 5.30 pm) presenting the entrance ticket to the Wonder of the World. Step 5: Return to the city of Cusco from the same way it was arrived. Once in Aguas Calientes, tourists can choose to stay overnight to visit the Wonder of the World early the next day. How to visit Huayna Picchu without tour? To visit Huayna Picchu on your own you need to book the ticket Machu Picchu + Huayna Picchu as well as train and bus tickets. Step 1: Travel at dawn by bus or minivan from Cusco to Ollantaytambo. Step 2: Take one of the first trains that leave from Ollantaytambo to Aguas Calientes. Step 3: Take the bus from Aguas Calientes to Machu Picchu. Step 4: Enter Huayna Picchu in Group 2 (from 10 am to 11 am). The rest is to enjoy Machu Picchu and Waynapicchu. Step 5: Return by the same form. A great option is to choose to stay overnight in Aguas Calientes and visit Huayna Picchu early and without hurry the next day. How to visit the Machu Picchu mountain without a tour? To visit the mountain Machu Picchu you need to buy the ticket Machu Picchu + Mountain as well as train and bus tickets. Step 1: Depart as early as possible from Cusco to Ollantaytambo. Step 2: Travel to Aguas Calientes with the first trains departing from Ollantaytambo. Step 3: Take a bus from Aguas Calientes to Machu Picchu. Step 4: Enter the mountain Machu Picchu in Group 2 (between 9 am and 10 am). Step 5: Return in the same way as the one-way trip. Do not you want such a quick and fatigued visit? The best option is to spend 1 night in Aguas Calientes and visit the Machu Picchu mountain the next day. How to visit Machu Picchu and the Museum without a tour? To visit Machu Picchu next to the Site Museum you must acquire the ticket Machu Picchu + Museum as well as train and bus tickets. Step 1: Travel by minivan from Cusco to Ollantaytambo at dawn. Step 2: Take the first trains from Ollantaytambo to Aguas Calientes. Step 3: Visit the Machu Picchu Museum located near the town of Aguas Calientes. Step 5: Return to the city of Cusco by the same route. The Machu Picchu Site Museum is open from 9 am to 4.30 pm Another option is to choose to visit the Inca City first and then the Museum. Although you do not need a ticket to hire a guide, you should know that the guide service is mandatory in Machu Picchu. You can book a tour guide with an online tourism agency. The advantage is that you can choose the language and the characteristics of the guide. Another option is to hire one at the same entrance to Machu Picchu. The cost depends on how many people are in a group. Is it cheaper to travel to Machu Picchu with a tour or on your own? Definitely traveling to Machu Picchu on your own is cheaper. The tours have a commission to organize the trip ..
Is the train trip the only way to get to Machu Picchu without a tour? No. It is also possible to do it on your own through the alternative route to Machu Picchu by Hidroeléctrica. The trip is longer but the cost is much less than the train ride. Is the bus trip the only way to go from Aguas Calientes to Machu Picchu? No. The other option is to walk up to the mountain where Machu Picchu is located. However, to avoid getting tired of the Inca City, the best option is to get on the bus and go downhill. 1 or 2 day visit to Machu Picchu. Which to choose? Machu Picchu is an attraction to enjoy with patience. If you have time, do not hesitate to spend a night in Aguas Calientes and know the Wonder of the World with tranquility. What entrance Machu Picchu to choose? The most difficult entry to achieve due to high demand and low availability is the ticket Machu Picchu + Huayna Picchu. This ticket allows you to ascend to Waynapicchu. This adventure is recognized as one of the best short walks in the world.